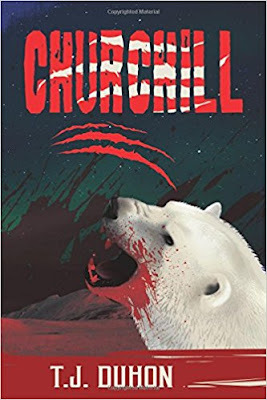 Sitting on a jagged rocky peninsula in Hudson Bay laying in the Northern Territories of Canada lies Churchill, a small town virtually cut off from the rest of Canada. There are three methods to get in or out of Churchill; air, water, and railway. However, all three entry ways are dependent on the weather conditions that are prevalent at any given time in this part of the Arctic Circle. . . . . . . Outside in the darkness it stalked with no consciousness, no malice or forethought, just a primal instinct. A primal instinct for preservation that has kept it a survivor for over one hundred and fifty thousand years. A species that survives eating the meat, flesh of its prey. The genetic makeup it possesses makes it unafraid of anything living on the sub-arctic tundra, the boreal forest, or even anything in the open sea. Even cannibalism was not out of its mind at this point. But now, tonight, there was a much easier target than one of its own, Man. Its basic instinct, hunger, could only be satisfied with meat. This winter night was going to be one that no one would ever forget. One where a life and death battle would rage in a remote outpost in the Canadian Northern Territories, and nothing could stop it. It would survive at any cost. In its path stood man, and he would have to deal with the problem not out in the immediate ecosystem, which consisted of snow banks and retreating sea ice, or on the tundra and in the boreal forest. No, this battle would be hand to hand, face to face, an inevitable confrontation of evolution that had been building for hundreds of years. The winter had come early this year. Its supply of food on the tundra, and in the boreal forest was gone. All it had left was its genetic primal instinct, and that meant whatever could be a meal was in danger. It would make its way to the sea and kill and consume anything in its path. Soon the beast would find a new easy way to satisfy its primeval need, hunger, and man was not ready. Although man knew it was coming, nothing had been done. Nothing could be done. Tonight was the dark night of reckoning. Nothing they could imagine would have prepared them for what lie ahead this night. It ruled the icy tundra, the rolling snow banks, and the dense boreal forest of dark spruce trees as far as the eye could see for thousands and thousands of years. Now it was mealtime.